Someone kindly sent me a schematic. Been working fine every day at 14A for years. Today, turned it on, got a new buzzing out of it, then about a minute later there was a bang, all the front panel lights went out, and the Bad Smell emerged. Invisible smoke. Everything has been working fine. I've added an emergency stop switch which disconnects the batteries from the inverter, through a 100A DC solid state relay. The switch is screwed to my desk, in one corner. Obviously I have no kids. chassis potential above ground, with safety implications. The 100 ohms reading was bogus, because current was flowing at the time of measurement and the meter is not designed for taking resistance measurements in-circuit. But the hum and voltage difference remains significant to the discussion. The safety earth for the amplifier departs from this path at the switched power board. So it is how the earth passes from the power board to the computer that has to be reviewed. The way in which the charger passes the earth to the output negative terminal is in doubt. It may need to be more explicit. There is no specification for it to pass the earth, yet I've always known that the negative terminal to be at earth potential. There is no external chassis earth lug. With the charger off and disconnected, the DMM reads 0.2 ohms between the chassis and the negative output terminal, but the reading took a little while to settle. The DMM also reads battery voltage between the positive output terminal and chassis. The next thing to do is to open up the charger and find out how the earth is passed. So, the computer has a sound card, and the output is connected to a Silicon Chip Studio Twin 50 Amplifier, thence to a pair of quite large speakers. The amplifier is powered from the same supply as the charger, not from the inverter. Ever since making this Online UPS, there has been a persistent 50Hz hum when the amplifier is on. Using a Digital Multimeter, measuring the AC voltage between the earth lug of the amplifier and the chassis of the computer ... 0.005V. Measuring the resistance with power applied to the computer and the charger ... positive 100 ohms, or negative 100 ohms, depending on how the probes are attached. Adding an earth strap fixes the hum. But will that earth strap ever have to take any fault current? here is how to do it better. Two more batteries were added to the bank. These are new VRLA batteries normally used for traction supply in electric scooters. They are 40AH each. That brings the bank capacity to 170AH, and a run time to depletion of about 12 hours. The charging current is now likely to trigger the over-current protection feature of the power supply. It was important to use sealed batteries, since this is meant to be an office environment. I also had to be able to lift the things. And they had to be available locally. There are far better batteries to use, but the intersection of these requirements is a small set. A few weeks ago, Quozl lost his Matrix 5000 UPS to lightning. 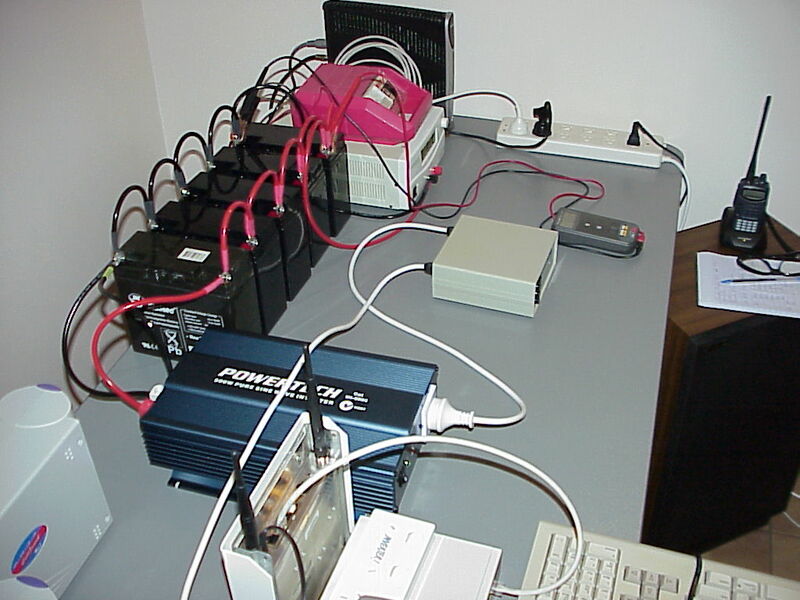 So he's used the bank of batteries with an inverter and charger, to form an online uninterruptible power supply. The charger has a voltage and current display. The battery and output voltage is also checked with a Fluke 10 multimeter. Starting up each morning involves turning on the float charger until the bank voltage achieves 13.8V, then turning on the regulated charger. Tested turning off charger for a few seconds, when turning it back on the display momentarily showed 54A, may cause protection feature to trigger on charger, may need a series resistance of some sort, no idea what will happen if it is off for longer while not monitored. Fan started after 35 minutes with room air conditioning set to 22C, and ran for a couple of minutes. 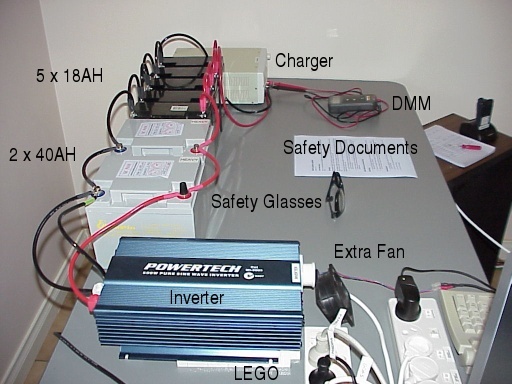 Mounting the inverter vertically or adding a low speed fan may alleviate. Casper in ##electronics asks whether efficiency has been checked, so this will be something to do. The energy meter was moved to the 240V supply of the charger, and showed 197W. That's an overall efficiency of 62%. 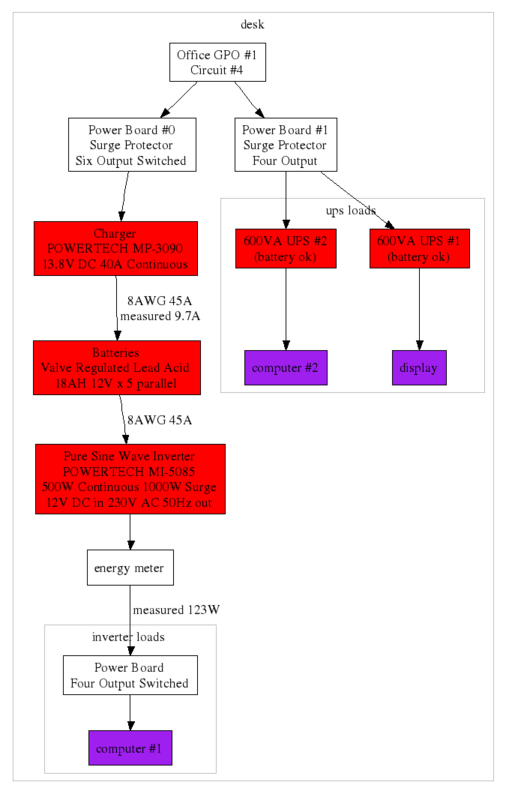 Calculation based on charge displayed voltage and current suggests roughly 93% efficiency of the inverter at 123W, which is well within the specified 85% efficiency at 500W.